The James Clarkson Environmental Discovery Center is a celebration of nature and a gateway to understanding through education. The ecosystems and gardens are places of gathering and knowledge, which open a window on the diversity and beauty of the native world. It is a center of learning and discovery where appreciation for the interdependency of living organisms is renewed with each visit. 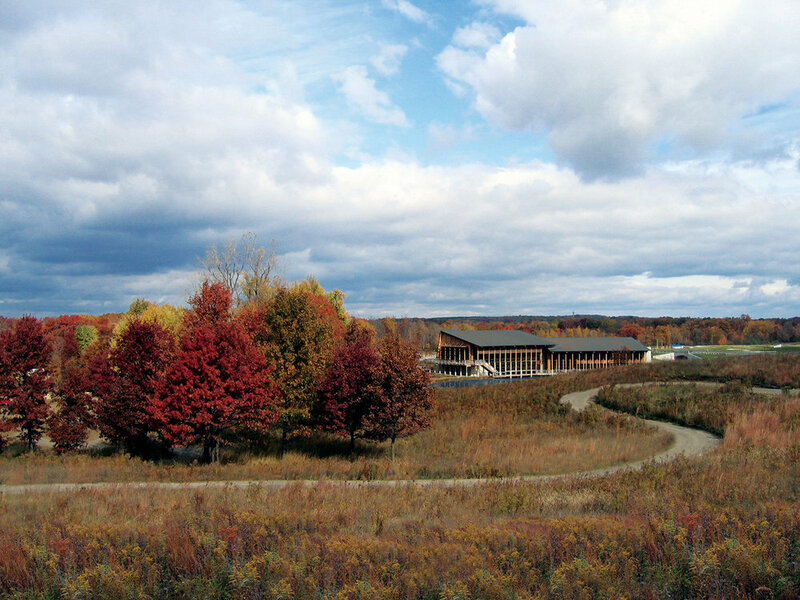 The 70-acre site, located within Indian Springs Metropark, takes advantage of the park’s naturally diverse ecosystems to create a unique and extraordinary educational platform. A major goal of the project was to integrate the restoration into school educational programs. The master plan includes teacher-training sessions, research, activities, and exhibits for groups of elementary through college age students. The Center also includes a working outdoor laboratory where students can collect samples and study microorganisms found in the wetlands. Years of farming and fertilization required extensive remedial work to eliminate the dormant weed and invasive seed bank. A method involving fire and herbicides was designed to eradicate the extensive growth of those non-indigenous species that were plaguing the site. Sustainable practices were utilized throughout the site and building development efforts.